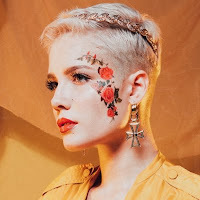 Halsey released the track listing for her anticipated second album, hopeless fountain kingdom, today (Apr. 28), revealing that she has collaborations in store with Fifth Harmony's Lauren Jauregui, Cashmere Cat and Migos' Quavo. In an Instagram post announcing the details, she also shared that some fans across America woke up "to a newspaper on their doorstep that features some clues and hints about hopeless fountain kingdom." The clues were seemingly hidden in a paper named The Kingdom Times, with headlines such as "What Happened at the Orpheus Tunnel?" and "A New Kind of Peace, A New Kind of War." Some fans across America woke up to a newspaper on their doorstep that features some clues and hints about hopeless fountain kingdom. Fans, of course, immediately began searching for clues.